Understandably, the exterior of a commercial property receives a considerable amount of attention with respect to its appearance; the types of materials used, colour schemes, landscaping, and signage all play important roles in generating curb appeal and inviting customers to utilize the products or services available within. However, one facet of commercial structures that should also receive due attention is the roofing. Although it is probably not the first feature that patrons or tenants see, the roof is a vital component to the overall operation and success of the business; its design and structural integrity have significant protective and financial implications for the viability of that business. In the construction of a commercial building or an industrial complex, the recommended practice is to install flat roofing. For owners and/or property managers of such Toronto properties, there are some fundamentally sound reasons that favour this style of roofing over the sloped/pitched roofs that are usually seen in the construction of private homes. 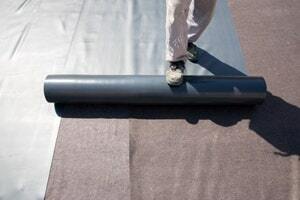 These materials are usually installed in sheets that are sealed along the seams/edges; due to the importance of the installation process relative to the roof’s performance and integrity, it would be highly advisable to engage the services of a roofing contractor with considerable flat roof experience, such as Integrity Roofers, to perform the installation. Fortunately, a full inspection by a roofing contractor that is skilled and knowledgeable in commercial flat roof repair and maintenance, such as Integrity Roofers, would recognize any potential issues before they become a problem and also identify situations that are in need of immediate attention. Furthermore, should the condition of the roof be such that a new roof is required, the specialists from Integrity Roofers can usually complete a flat roof replacement in one or two days, thus limiting any disruption and inconvenience to patrons and tenants of the commercial building. For more information on the commercial flat roof repair and replacement services offered by Integrity Roofers, a leading roofing contractor in Toronto for more than 20 years, visit our Commercial Flat Roof Repairs page. For any/all needs related to commercial flat roofing, including inspection, replacement, or repair, Call the flat roof specialists from Integrity Roofers today at 416-639-0779 or Contact us to request an onsite visit and/or a no-obligation quote.